Era 1920’s Party at Cana Rum Bar: Calling all sheiks and shebas! 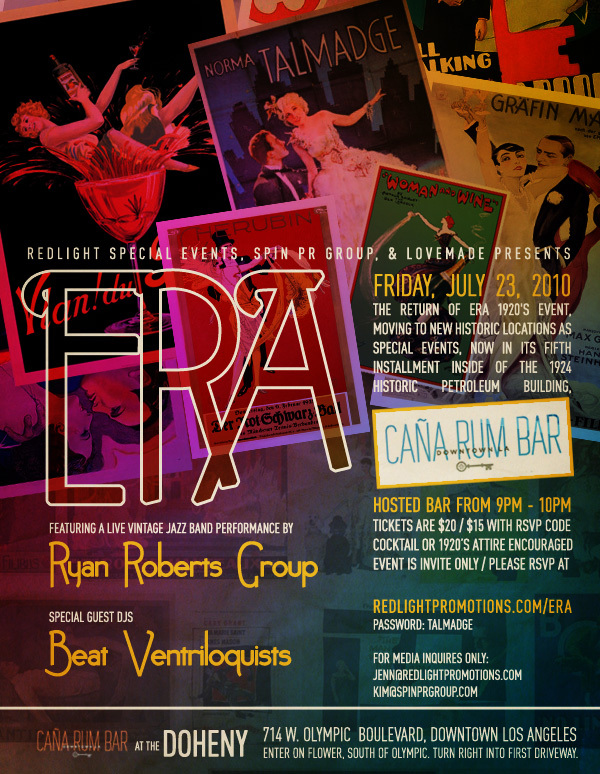 Drink like it's illegal at the ERA Party at Cana Rum Bar! Flappers and flippers, dud up and drag a sock down to Cana Rum Bar at the Doheny for whoopee and whangdoodle at the return of the ERA, a 1920’s party. Presented in connection with Red Light Special Events, the boffo, invitation-only (so RSVP below, lounge lizards) event on July 23rd costs 20 bricks at the door or 15 clams with special Prohibition/speakeasy-type password). The hosted bar is from 9-10PM; rum will be the featured giggle water, natch. Grab a flop, bar side, or stretch your stilts on the patio with the smoke-eaters while lapping Santa Teresa rum cocktails. Allan Katz, the Cana Rum Bar’s new General Manager, will be overseeing the hooch, special guest DJs Beat Ventriloquists will tickle your eardrums, and the Ryan Roberts Group will get hot with live vintage jazz. Cocktail or 1920’s attire encouraged so gander up in glorious regalia and ankle over, jazzbos and barlows; this blow will be the berries! No hokum! Previous Post Go Go Me! Ms. Go Go is happy to help…with comedy for generationally challenged groups.